It is very important as citizens to hold each elected representative accountable for the office they are responsible for. 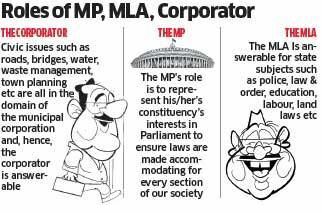 For example, if a corporator knows that the voter will hold the MLA and/or the MP responsible for his failings, it increases incentive for the corporator to underperform and damage credibility of the MLA or the MP. Similarly, if we do not hold our MP accountable for national issues and instead evaluate them on local civic issues, we do not incentivise the MP to ask more questions in House. It is understandable, given the apathetic state of polity and governance, that very often citizens feel frustrated and helpless and rush to anyone that is elected, to air grievances and seek help. But that is unlikely to lead to solutions and it is in our best interests to ensure that we hold the right people accountable for the right issues. In the Lok Sabha polls, ask your MP candidate the right and relevant questions. Perhaps, Bengaluru with its civic minded citizens can lead the way?